Summarising the best cycling in Europe is by no means an easy task. From the serene Dutch countryside to some of the most prestigious cycling routes in the world in the Spanish Pyrenees and Southern France, Europe is truly the home of cycling. The continent is ideal for family cycling holidays, perfect for cycling with friends and, evidently, a haven for seasoned riders with options to ride sportives, training camps or head off on a self-guided trips, taking on a famous climbs each day. Below you'll find a quick guide to cycling in Europe: the best trips for experienced riders, the best family destinations, the cheapest places to travel and much more. Cycling holidays in Europe are increasing in popularity every year so we're here to ensure your decision making process is made that little bit easier. Cycling in Tuscany, Italy. A stunning region where traditional Tuscan villages rise above the sweeping countryside. 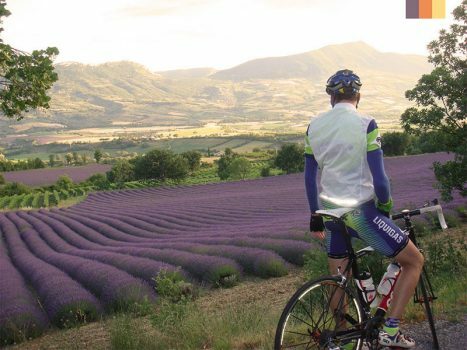 Luberon, the beautiful and vibrant region in the south of France, offers unique rides for cyclists of all ability. The Canary Islands make up some of the most popular cycling destinations in Europe. Lanzarote (pictured) offers slightly easier riding in comparison to its neighbours Gran Canaria and Tenerife. Just one of the luxurious hotels you can stay at during your trip to Mallorca. The Monnaber, located in the north, is perfect for rides out to Port Pollensa, Sa Calobra and the Cap Formentor lighthouse. If you’re searching for family cycling holiday’s in Europe, you don’t need to look any further than Holland or the Loire Valley. Holland, also known as ‘the lowlands’, is perfect for young riders and offers exceptional cycling routes broken up by fun family activities and stunning views. More experienced riders can extend their riding days whilst less seasoned cyclists can choose to ride shorter routes, visiting traditional towns, villages and cities such as Amsterdam, Gouda and The Hague along the way. The Loire Valley, located in central France, is also a family favourite. As you ride from east to west you will encounter the vibrant French countryside and incredible chateau’s before staying in a selection of picturesque French villages. Cycling in the UK is always a great option for a long weekend on a low budget. The Lake District, New Forest and Oxfordshire are all options worth considering if you're short of time and funds. Expanding your reach further, we offer great, low budget trips in Mallorca due to the number of contacts and partnerships we have with transfer companies, bike hire companies and hotels. From just £155, our Cycling Break from Mallorca holiday is a particular favourite. More experienced riders may choose to head to Girona and follow the training routes of Team Sky and other Tour riders. The Girona Road Riding Weekend is low cost and offers unique riding, stunning views and an unforgettable few days on the bike. Seasoned riders don’t need to travel any further than Europe to experience some of the best cycling routes in the world. Some of our favourite destinations, many of which have featured on the Tour de France and the Vuelta a Espana, include the Spanish Pyrenees, the impressive hills in Southern France (including Mont Ventoux and Alpe d’Huez) and the most popular cycling holiday destination of them all, Mallorca. With an abundance of world renowned routes, famous climbs and expert knowledge, you will be guaranteed an incredible cycling holiday in Europe. Climbing is, for some (admittedly, not everyone), one of the best things about cycling. Reaching the top after the horrible but amazing struggle is a feeling unlike any other. With some of the most famous climbs in the world located in Europe, its hard to choose just one. However, there's no harm in setting yourself a goal, which is why the team at Love Velo have decided on Alpe d'Huez as the best climb in Europe. Sitting at 1,860m, you'll climb for 13.8 km with an average gradient of 8.1%. You'll ride the famous 21 hairpins that reach a maximum gradient of 13%. It won't be an easy ascent but the views over the French Alps at the top will make it worth it. Good luck! Cycling with friends is a great way to spend a vacation. Our cycling holidays are perfect for this as you can choose how much riding you want to do. If some want to spend long days climbing mountains and others prefer to relax by the pool, this is more than okay! Whilst you can enjoy this all over Europe, we personally love Ibiza as a destination to ride with friends. The beautiful island offers great cycling routes as well as luxury accommodation and great places to relax in the evening and eat out/grab a drink. Wherever you decide to travel, we can adjust your holiday to suit the needs of you and your group and ensure you have the best possible holiday with friends. As cycling is very dependant on the individual desires of each rider, its hard to pin down one destination as the best. However, an area we love, due to its natural beauty, its authentic cultural history and its stunning architecture is Florence and Tuscany. The scenic region offers incredible cycling amongst the vibrant countryside whilst stopping off at rich, authentic landmarks such as the iconic San Gimignano. The food is unique to the region and, if you choose, we offer luxury accommodation in various places around Chianti. It's a trip that suits everyone and certainly one of our favourites. With social media now synonymous within our everyday lives, its more important than ever to get some great holiday pictures and make all your friends jealous. Whilst every European destination offers a unique picture opportunity, one of our personal favourites is the French Riviera. The vibrant coastal towns contrast the turquoise Mediterranean coast and, when viewed from above, are truly spectacular. Other great photo opportunities can be found along the canals in Amsterdam, down the west coast of Croatia or amongst the stunning mountainous landscape in Tenerife. Make sure to tag us Instagram, Facebook or Twitter and we’ll share your holiday pictures! Why Travel to Europe with Love Velo? Our bespoke cycling holidays are perfect for people looking to explore Europe on two wheels. As experienced travel operators we have great links with hotels, transfer companies and bike hire companies all over Europe. We also have personal experience riding in every destination we offer meaning you'll be given the best advice regarding places to eat, things to do, where to ride and more. You'll be provided with the best routes in the area and multiple other benefits by booking your trip with us, whilst ensuring all your requirements are met. We can't recommend cycling in Europe enough and would love to get as many people out there as possible!